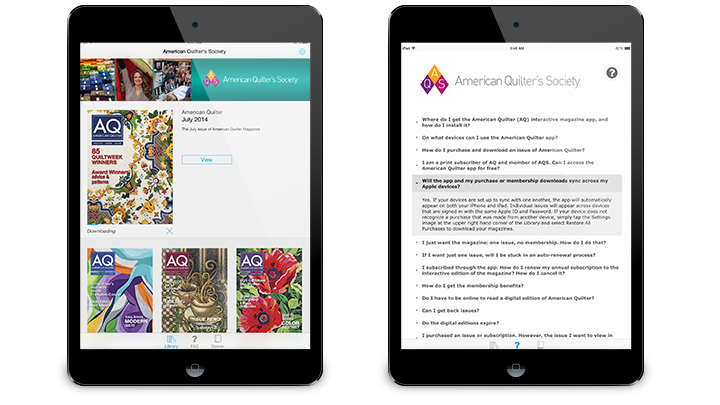 DPCI provided Adobe Digital Publishing Suite consulting and direct entitlement development services to assist American Quilter’s Society with the creation of the American Quilter Magazine application for iOS devices. American Quilter’s Society (AQS), founded in 1984, is the largest quilting membership organization in the world. With a focus on quilting inspiration and creativity, the society offers its members a broad suite of products and services including magazines, catalogues, books, live events, workshops, fabric patterns and more. AQS publishes American Quilter Magazine, a bi-monthly print magazine for subscribers and society members that offers stories, tips and suggestions from the quilting world. The digital edition of the publication already existed in Apple’s App Store, but AQS management felt that the organization could benefit from a digital publishing solution that allowed content creators to incorporate more interactivity within the app. AQS also required a distribution service that allowed existing subscribers to access paid content within the digital applications for no additional charge. 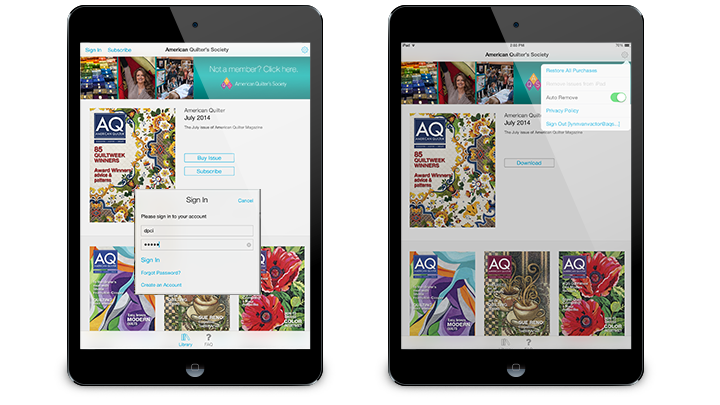 Management decided to use the Adobe Digital Publishing Suite (DPS) Enterprise Edition along with Adobe InDesign to create customized, interactive content for the tablet application of American Quilter Magazine. AQS selected DPCI to provide Adobe InDesign and Adobe DPS consulting services to help optimize and repurpose content for Apple devices. DPCI provided a series of in-depth training sessions, in which AQS content creators and designers learned how to develop rich, interactive pages for the American Quilter Magazine iOS application. To provide existing print customers with access to subscriber-only content, DPCI utilized the PHP framework to build an entitlement server and associated web services to connect the Adobe DPS app with AQS’ existing MySQL subscription database. In addition, DPCI provided AQS content creators with extended technical support and training including the validation process for iOS applications and utilizing the Adobe Digital Publishing Suite Dashboard for publishing folios and building custom apps. Prior to launch, DPCI verified all assets bundled within the applications in accordance with Adobe DPS and Apple specifications for standard and HD (retina) tablet devices. 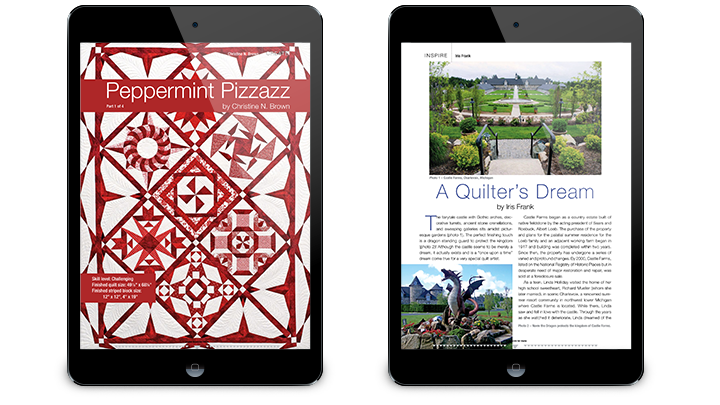 AQS premiered the new American Quilter Magazine app in the Apple App Store for iPad and iPhone in July of 2014. 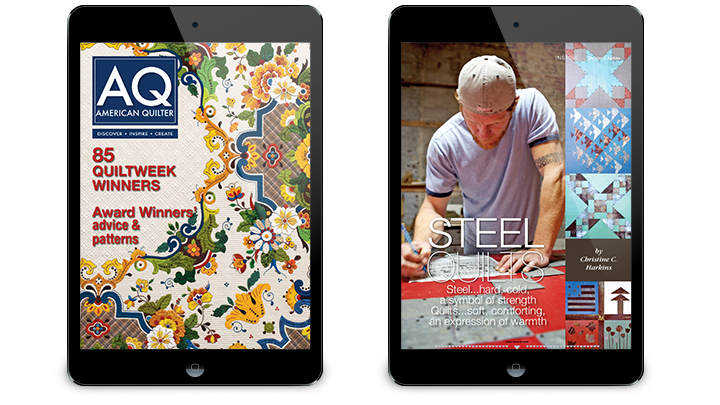 With the help of DPCI’s Adobe certified consultants, AQS implemented a vibrant, interactive iOS Newsstand application that entitles existing customers to easily access subscription-only content, while captivating a mobile audience of potential subscribers with more interactivity and quality tools for the beginner and advanced quilter.